Dallas is known for many things: Fortune 500 Companies, the Dallas Cowboys, and great shopping and dining. But it may be most infamous for the assassination of John F. Kennedy. I always like to get a glimpse of the history of a place I visit. My mother lives in the greater Dallas/Fort Worth Area, and the 6th Floor Museum was the first place we drove to after stepping off the plane. The very first notable thing about visiting this museum is that the darling woman running the ticket booth called me “sugar.” About 25 times. Is that how I know I am in Dallas? She was charming, and I already felt loved and validated, even though I had only been in the city approximately half an hour. How great is that? My only regret at that moment is that I was not eating a pecan or sweet potato pie. I mean, if I am “sugar,” don’t I also deserve pie? I think this is a valid point. Perhaps the city of Dallas can figure out how to greet people with pie kind of like how Hawaii greets people with leis. 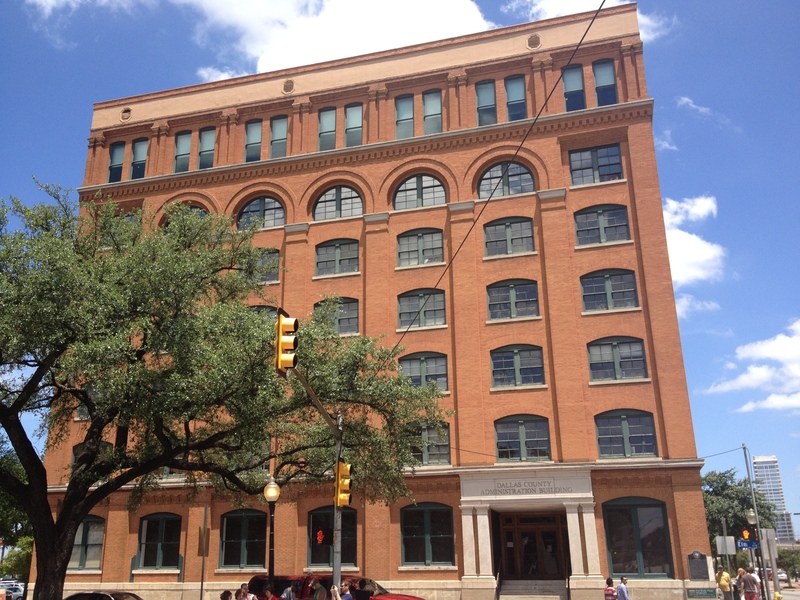 This museum is actually located in the very building from which they *think* Lee Harvey Oswald shot JFK. Here is a picture of the outside of the building. The window from which Oswald *allegedly* aimed the gun is on the upper left hand side. The street view from the building looks like this. 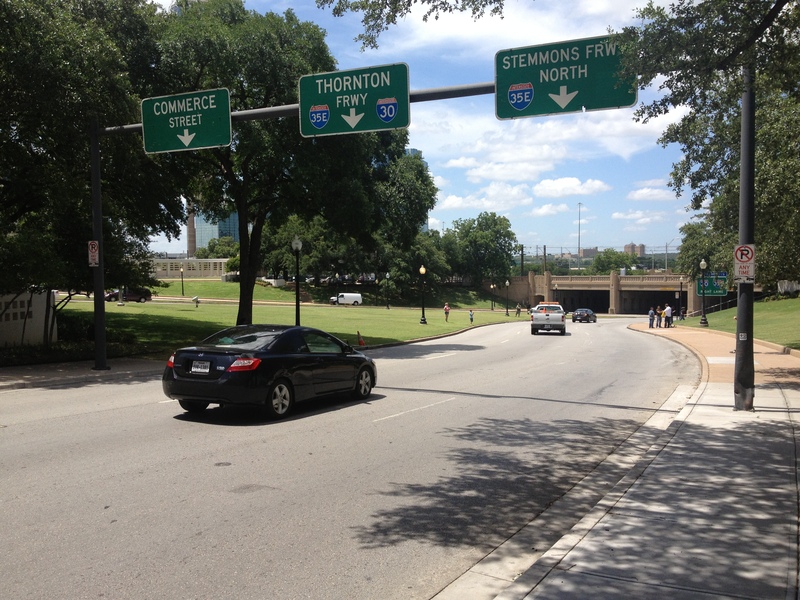 It was this exact street that can be seen in all the video footage of the assassination. You enter the ground floor of what used to be a textbook warehouse, and take an elevator to the 6th floor for the museum. The tour comes with a nicely done and interesting audio guide. You can follow the numbers, listening to the basic outline of the tour, or you can also listen to a variety of supplementary materials for a more in-depth visit. This isn’t a particularly fancy museum, but it is well done and immensely interesting. My 11 year old, who claims to “hate history” because is it “boring,” kept up with me the whole time and listened avidly. Later I asked her about it and she admitted to actually finding it interesting. Through news footage, pictures, documents, interviews, and eyewitness accounts, the museum details the events on that fateful Friday, November 22, 1963. Additionally, it explores some of the subsequent mysteries and mythology surrounding the death of JFK. My mother, who was a teenager when she heard about this event first hand, said the experience was a little surreal and brought up feelings and sensations that she had not felt or thought about for a long time. We spent about two hours there, at a fairly leisurely pace. I don’t think very young children would like this museum, but I would think most children ten and up would enjoy the experience. I did find the experience somewhat emotionally exhausting, since the emotional impact of this event was made very clear. How could the First Lady handle such a traumatic event? Her husband was brutally assassinated, right before her eyes. And then, even as her husband was pronounced dead, she was on Air Force One while the Vice President was sworn in. She looked shell-shocked, but grim and determined. There was not time for private grief; the funeral was televised the world over with cameras focused right on her. I was stunned by her strength and poise. Incredible. Is the assassination of JFK one of those pivotal events in history? How might things have been different if it wouldn’t have happened? Some believe that the assassination of such a well known icon opened an era of incredible difficulty for the US, as well a level of cynicism in the people. Could these things have been avoided? I know we can only contemplate “what if” scenarios for so long, but I just can’t help it when it comes to this. Despite having been in office for less than 1000 days, President Kennedy had a such a vision that his impact is undeniable. Civil Rights legislation, the Peace Corps, Space Travel, and the avoidance of Nuclear war are just some of the things he either accomplished or started during his term. Perhaps a little bit of a sobering start to my visit in Dallas, but I would highly recommend this location to history buffs anywhere. Actually, I would suggest that perhaps any American citizen should go. We all have an obligation to know and understand our history as best we can. Now, I will get down off my soapbox. Thank you. I went to that location with my parents, but we didn’t end up going to the museum. I’d love to go back and do it.